From one star-studded studio session to another. Young Jeezy, Usher and Jermaine Dupri were snapped in J.D.’s Atlanta lab together last night. Rap-Up report that Usher’s upcoming eighth studio album was on the agenda, so could this mean we have another “Love In This Club” chart-topper to look forward to? It seems like Yasiin Bey (formerly Mos Def) only surfaces from his musical hibernation every few months to drop a guest verse or a freestyle, but it’s been a while — almost two years, in fact, when Black Star released “You Already Knew” — since we’ve heard a proper new record. This painful wait comes to an end this Easter Sunday as the Brooklyn wordsworth debuts the aptly-titled “Black Jesus,” the first single from his upcoming collaborative project with Mannie Fresh, OMFGODBKNOLA (decoding not needed). It’s safe to say it’ll yield some pretty interesting songs. With their troubles seemingly behind them, Mobb Deep made their reunion official during the opening day of Paid Dues 2013 in San Bernardino, California last night. Among their catalog of classics, Havoc and P performed their timeless Infamous cut, “Shook Ones Pt. II.” Forget chocolate eggs; this is the only gift we want this Easter. Don’t forget, the Queensbridge duo hit the road on May 9 for their 20th Anniversary Tour. One of the biggest festivals in the hip-hop calendar, Paid Dues, got underway in San Bernardino, California last night. First-time headliners Black Hippy, who Interscope’s newly-appointed President of Urban Music, Joie Manda, called “the most important movement in music right now,” helped provide a warm welcome to the West Coast crowd. Kendrick, ScHoolboy, Solo and Jay Rock killed it with their posse cut, “Black Lip B*stard (Remix),” before K. Dot performed his “B**ch Don’t Kill My Vibe” remix (sans Jay-Z), “Money Trees” with Jay Rock, and “m.A.A.d city,” joined by his whole crew on stage. French Montana loves to remix R&B records. After closing out last year appearing on Ne-Yo’s “Let Me Love You,” the Coke Boy adds his street edge to Brandy’s “Can You Hear Me Now.” Produced by Rico Love, you can purchase the original version off the singer’s Two Eleven album on iTunes. 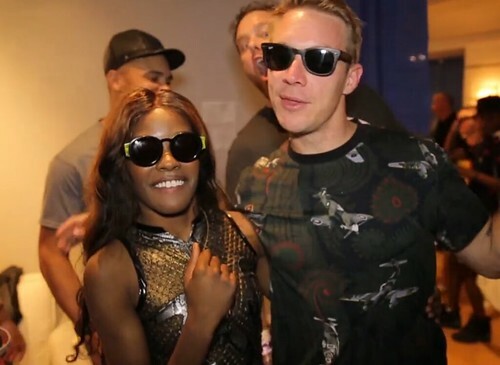 Listen to the remix below…..
Azealia Banks recaps her wild trip to South Beach in “No Problems,” a song that served as a diss track to fellow femcee Angel Haze. We follow Banks during her appearance at this year’s Ultra Music Festival in Miami, Florida last weekend. From the beautiful beach, to wild ravers, and some performance clips, enjoy the Rony Alwin-directed visual that includes cameos from Steve Aoki and Diplo. Her Broke With Expensive Taste debut album is due later this year via Interscope Records. Listen to the first offering “Yung Rapunxel” here, with a new single and video arriving on April 16. After hitting 4 million followers on Twitter, Big Sean thanks his fans with a rare look back on his recent 25th birthday. The G.O.O.D. Music rapper started his busy weekend off performing with Snoop Dogg at a private adidas Originals concert last week before heading to Syracuse, NY for a show. Battling a recent flu, the Detroit Player made his way back to Los Angeles as his family and closest friends threw a surprise party for his birthday on Monday. Wiz Khalifa, No I.D., Jhené Aiko, Travi$ Scott and Naya Rivera were noteables that attending the private soiree at Wolfgang’s Steakhouse in Beverly Hills. With his mother and father by his side, Sean explains how his folks pulled off the surprise while Rivera and Wiz Khalifa send their well-wishes on video. 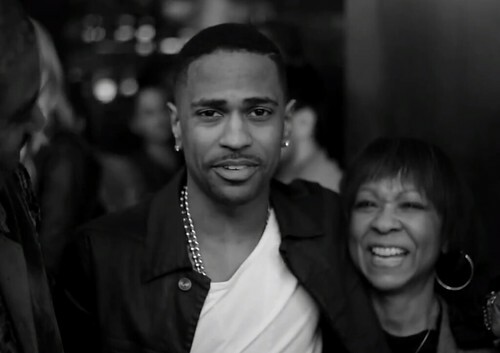 Big Sean’s Hall of Fame sophomore album is due later this year. Expect new music to arrive in the coming weeks. 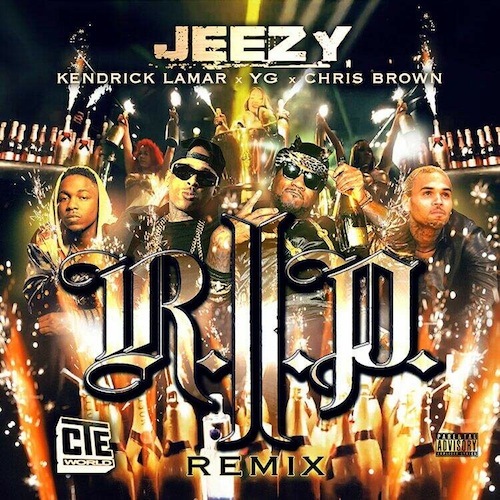 Check out the recap vlog below…..
Fresh off giving us the 2 Chainz-assisted video, Young Jeezy keeps it rolling with the official remix to his club-smash “R.I.P.” The Snowman grabs YG, Kendrick Lamar, and a rapping Chris Brown on the bouncy DJ Mustard-produced cut. Enjoy this Gangsta Grillz premiere by DJ Drama. Chris Brown with some words for Drake? Listen to the “R.I.P.” remix below….. Following in the footsteps of Elliott Wilson, veteran hip-hop journalist Shaheem Reid recently launched his own new web series, The Round Up, on Jay-Z’s Life + Times YouTube channel. After discussing top 5s, the long-awaited L.O.X. album and his new solo LP with Jadakiss last week, Sha returns with Wale in the hot seat. The MMG rapper spoke on challenging himself on his new album, The Gifted, his top five Foamposites, his come up in the game, the downsides of fame and finally understanding Jay-Z’s music when he grew older.